I'm not a purse girl. Really, most ladies love their purses and handbags, and most of my friends have multiple styles, sizes and colors to match their outfit and needs. I, however, have one purse-a smallish black one-that I only carry when I absolutely have to. Call me a tomboy, but I don't like having a purse hanging over my shoulder wile I'm out and about, I much prefer slipping the necessities (for me it's my license, cash, and maybe a bank card) into my pocket or, if that's not an option, stashing my things in my sister's purse! However, after trying out a LeSportSac handbag, I have to say I have found one purse I don't mind carrying! I received the Camille purse for review from LeSportSac. The Camille is a medium-size bag, and features a zip-closure main compartment, exterior front pocket with a snap-flap closure, and exterior back pocket with snap closure. Additionally, the main compartment features two interior front-side open pockets, and an interior back-wall zip pocket. Needless to say, you have plenty of room to stash and carry all your necessities; cellphone, wallet, lip balm, pocketknife, etc. Honestly, I think the thing I like best about this purse is how lightweight it is. Instead of starting with an already weighty bag then adding all your extra items and ending up with a bag of bricks (or so it feels) hanging from your shoulder all day, you start with a bag that literally feels like it weighs nothing! As much as I love the durability and function of the purse however, I know that the appearance plays a part as well. The Camille comes in several different colors and prints, as well as solid colors. As you can see, mine is a lovely floral print with a lovely combination of green, yellow, red, and blue. It's perfect for the spring and summer months especially. Believe me, when you go out sporting the Camille bag in this Tirol Floral print, you will get compliments!! LeSportSac was kind enough to send along a second Camille Purse, so here's your chance to win!! Must-Have Kitchen Gadgets from Vacu-Vin! I love finding new gadgets and tools to make life easier or more fun, and that is especially true when it comes to the kitchen-my favorite place to work! Recently I discovered a company that has a whole catalog of just such tools for your kitchen, called Vacu Vin. I'll be honest; I had never heard of Vacu Vin until last month. After checking out their website, I'm wondering why I haven't discovered them before! From the handy slice and catch tool to the cute and useful PopSome cake decorating set, you will be amazed at the choices. I received the Instant Marinater, and the Active Cooling Carafe for review. The Instant Marinater is an amazing tool that every chef needs in their kitchen! I have used it several times in the past few weeks, and I know it will get a lot more use now that the weather is actually staying at warmer temps. This might look like just a pastic storage container at first glance, but it's so much more. Place your meat (or whatever food you're marinading) in the dish, add your marinade and snap on the lid. The process doesn't stop there though; next you attach the included pump handle to the center of the lid, and pump out the air in the container. Let your food marinade for the required time (using the instant marinater it's only minutes!) and you're ready to go. The idea is that by pumping the air out of the container, it creates a vacuum effect, which opens up the pores of the meat. This means the marinade soaks in within minutes, and it also tenderizes the meat, for a flavorful, tender, tasty meal in less time than I can write about it! In case you're thinking this is too good to be true-it really does work! I used this for some sweet and spicy bar-b-que chicken legs, and literally only left the chicken in the marinater for about 10-15 minutes before cooking. And the taste came through great! The 2nd item I received is also one we will be getting a lot of use out of over the spring and summer. The Active Cooling Carafe will chill your beverages-without ice-in 5 minutes, so as I said-a lot of use this summer! It's perfect for outdoor bar-b-ques and back porch get-togethers, because it doesn't water down your drink as the ice melts. Instead, freeze the cooling elements for several hours before use, then replace in the cooling stand. Fill the carafe with tea, lemonade, milk, juice, etc. and slide it down into the cooler. In 5 minutes you've got a nice, icy cold drink! I actually used this with freshly-made (hot) sweet tea, and even though the tea wasn't just room-temp, but actually hot, it only took 7 or 8 minutes for it to reach a cold temperature! I would recommend the Active Cooling Carafe to anyone who likes ice cold drinks without the watered-down, melted-ice aspect of it! Be sure to visit Vacu Vin and check out all their other great products for the kitchen and table. I'm sure you'll find at least one or two items you would love to add to your kitchen! Sprucing Up With #TomboyTools This Spring! Finding a quality service that is low-cost can be difficult, no matter what field you're looking in. We have several birthdays (not to mention Mother's Day) coming up in the next month or so, and shopping for gifts has been a big event, as I'm sure you can imagine. I love giving unique gifts, and custom gifts, so when I discovered CanvasChamp, I knew it would be a perfect gift idea. Hint:Everyone who still needs a Mother's Day Gift; instead of those oh-so-boring flowers and chocolates, why not get mom a custom canvas print?! I received a 16x20 canvas print for review. The very first thing I noticed when receiving the package, is how well the print is packed for shipping! I unwrapped a layer of plastic wrap, then cardboard, then another layer of plastic shrink wrap. Be assured, your print will not get damaged in shipment when you order from CanvasChamp! I think it's the best packing job of any canvas or photo site I've ordered from. Once I uncovered all those layers of packing, I discovered my canvas. It came on a thin gallery wrap frame so it's all ready to hang, and the frame is very sturdy. Not one of those flimsy, this-will-break-if-it-gets-knocked-off-the-wall kind of things (yes, I have one of those, that I purchased through a pretty big-name company). It also includes the mounting pieces, and clear instructions so you can easily and properly hang your canvas. Now, the print itself-is amazing! The colors are so clear and natural, you feel as if you're literally standing in the picture! I am excited about giving this to my parents for them to enjoy; a picture we took this past fall, that they will love to show off by hanging in the living room or dining room, I know. So, if you're looking for a gift for Mother's Day, have a birthday coming up soon, or just have a special memory/picture you'd like to hang on your wall, I recommend CanvasChamp-it's low cost, it's quality, and it's fast! In 2009, Susan Petersen began making baby moccasins after getting frustrated with the lack of well-made children's shoes. Using a bag of scrap leather, and testing her designs on her second child Gus, the Freshly Picked brand was born. Now, when you're looking for adorable moccasins that will stay on your child's feet, and add an extra layer of cuteness to your little one, you know exactly where to look-Freshly Picked, of course! I received a pair of the Frosted Rose Moccasins for review. Now, I don't have a little one small enough to wear any of these moccasins, so I checked them out myself, and now I'll be sending them to a friend's little girl to enjoy. So, please excuse the lack of a little one actually wearing the moccasins in the pictures! (I did have fun with the photo shoot, though :). Anyways, let me tell you what I think about Freshly Picked moccasins. First off, they are adorable. I know I've already said it a few times, but they are just so cute! The style, the color, the design...the combination of all these makes the Freshly Picked moccasins the absolutely cutest footwear I've ever seen for babies and children. I also like the elastic, that ensure the moccasins will stay on your child's feet. Of course comfort is more important than looks when it comes to your child's footwear, and while I haven't been able to "test drive" these on a little girl, they do look very comfortable. The leather is very soft and pliable, not stiff or rigid. The moccasin will move with your child's foot, not against it, and I am very sure that any little boy or girl would enjoy styling these moccasins! They also seem very durable, so you don't have to worry about the moccasins falling apart after a couple wears. I will be keeping Freshly Picked in mind for all my friends' baby showers and such from now on, as these would make the perfect gift for any new parent! One of my readers will receive a pair of Freshly Picked Moccasins in their choice of color and size (based on availability)!! Hey all, are you familiar with the GMO labeling battle? I'll be honest, I don't keep up much with these things, but I have heard a little bit about it. Basically, for those unfamiliar, GMO's are genetically modified organisms, and can include anything from your fruits and veggies to health care products. Did you know that over 50 countries have significant restrictions, and some even have outright bans, on GMO products? Yet in the US right now, companies are not required to even label their GMO products as such! The only way you can be assured that you are not using a GMO is by purchasing products with the USDA Organic seal. One such company is Coldstream Naturals, an oral care company that is completely GMO free. I received the Purely Peppermint Organic Mouthwash and Organic Tooth Cream for review from Coldstream Naturals. Both of them, while having a distinct and fresh mint flavor, are not that overly strong, distasteful peppermint. You know the kind that burns your tongue, and leaves you needing to rinse your mouth out afterwards? I love using both products morning and evening; they leave my mouth feeling clean and fresh, with a nice minty breath. The organic tooth cream doesn't foam up like most toothpastes do, but it does get the job done. It cleans and polishes your teeth, and also cleanses the gums (a very important part of oral care that is often overlooked). These are the only non-GMO mouthwash and tooth cream in the country, and when you read the ingredient list, you can see the difference. Organic aloe barbadensis leaf juice, organic peppermint oil, cinnamon bark oil, stevia and sodium bicarbonate are some of the ingredients. What a difference from your average oral care products! If you want to feel safe while caring for your teeth and gums, I suggest you try Coldstream Naturals-the only GMO-free oral care products in the USA! Cleaning Made Easy With The SteamMachine! How would you like a dual-purpose tool for your home that cleans and sanitizes practically any hard surface-from floors and counters to bbq grills and stovetops-and removes wallpaper?! Sounds too good to be true, right? A single machine that will peel that old wallpaper off, and the next day can be used to clean and/or disinfect your kitchen, bathroom, and grill? Yes, it's true-the machine you've been looking for all these years is called the SteamMachine, brought to you by HomeRight! I received the SteamMachine for review, and let me tell you-my first though was exactly what I mentioned, this has got be too good to be true! Upon arrival and use though, I discovered that it works perfectly, and makes cleaning so much easier and faster. I'll be honest, I haven't used it for removing wallpaper at all-we don't have wallpaper in most of our house, and haven't needed to replace any recently. However, when it comes to cleaning and sanitizing, this is the perfect tool. The SteamMachine comes with a multitude of accessories and add-ons to customize for whatever you need. Whether it's a small brush to get a hard-to-reach area behind the toilet, or a larger cleaning surface for big areas like the kitchen floor, you can utilize the SteamMachine for anything and everything. Our kitchen and bathroom both have some hard-to-reach areas (under the dishwasher, behind the toilet...you get the idea) that the SteamMachine makes so much easier to clean! I'm also planning on getting quite a bit of use out of it for cleaning our grill, now that we finally have warmer weather to bbq! The children always dread the "Whose turn is it to clean the grill?" question after a bbq, but now cleanup will be a snap! So, have you decided you need a SteamMachine yet? 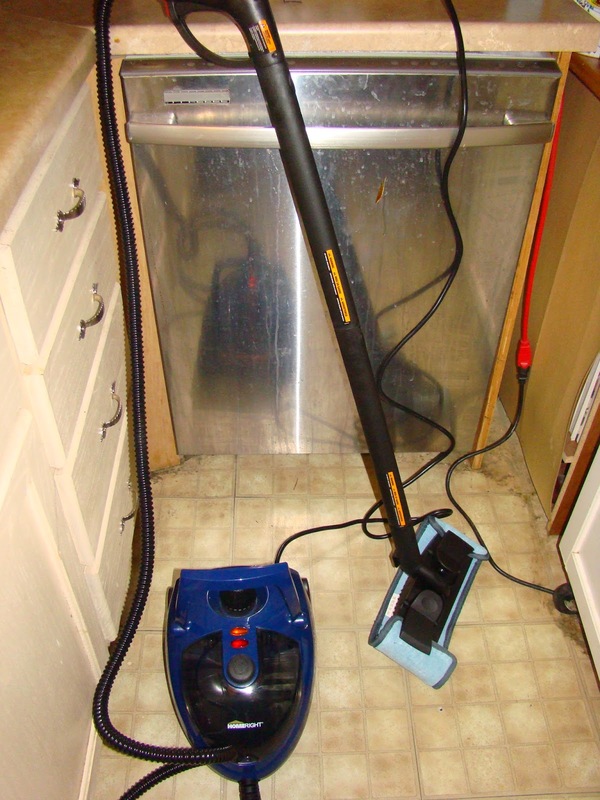 Believe me, this little machine will change the way you clean, and how long you clean! No more scrubbing on hands and knees to get that spot under the counter, or getting frustrated when that stubborn spot on your stove won't come off. Just turn on the SteamMachine and you're good to go! One-Of-A-Kind Wifi Baby Monitor from D-Link! !